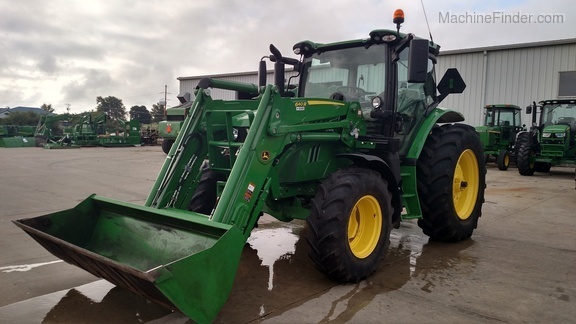 Description: 2015 John Deere 5085E, MFWD, Standard Cab, IT4, 16.9-3 R1 rear, 11.2-24 R1 front, dual rear SCV, radio, H240 loader included. 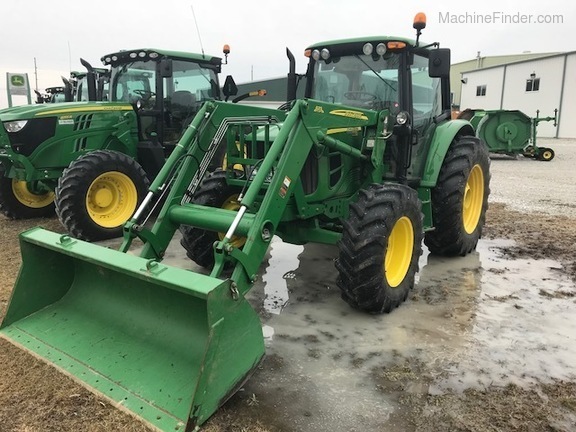 Description: 6420 CAB TRACTOR, MFWD, 18.4R34 GOODYEAR REARS 60%, 14.9R24 FRONTS TIRON 95%, 16 SPEED AUTOQUAD WITH LEFT HAND REVERSER, AIR RIDE SEAT, 3 SCV'S, 673 LOADER WITH BUCKET, GLOBAL HOOKUP. 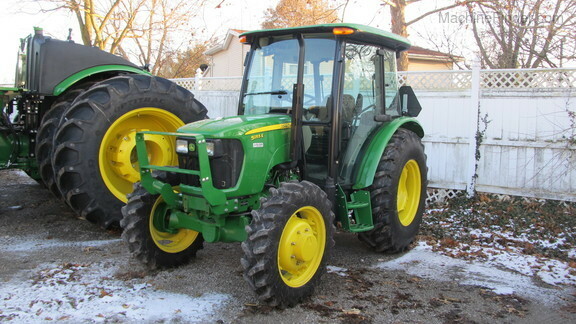 Description: 2 OWNER JD 4020 DIESEL WIDE FRONT WITH 46A LOADER, SYNCRO TRANS, 2 REAR SCV, 3PT AND 540/1000 PTO. 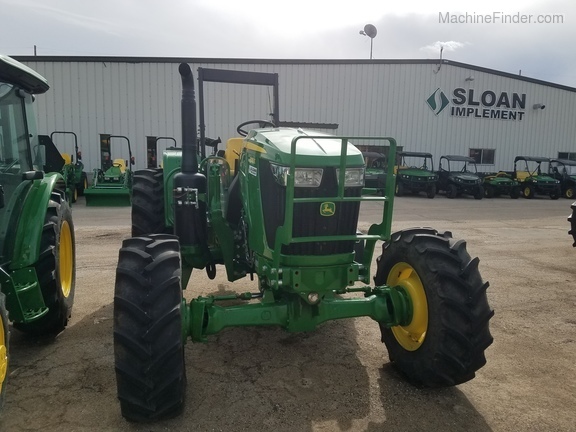 Description: MY18 120/95 hp, Std Cab, 24F/24R AutoQuad w/ LH Rev, 7" display, Air Seat, Ext Mirrors, radio, 3 mech SCVs, 540/E/1000 PTO, R&P Axle, 460/85R38 rears MFWD, 380/85R24 fronts, cold start, 3 func joystick & mid mount valves, loader ready, hood guard & frames for 620R loader. Description: MY18 120/94hp, Cab with Air Seat, RH Door, Command Center, AutoQuad 24/24 w/ LH Rev, radio, 30gpm hyd, 3 Mech SCVs, 540/E/1000PTO, R&P axle 460/85R38 rear, MFWD, 14.9X24 Ldr Ready, 3 func mid mt valves, loader frame & hood guard for R-Series Loader, cold start pkg, batt disconnect. Description: 6430 premium cab, 18.4r38, 14.9xr24,24speed autoquad with left hand reverser, rack & pinoin cast rear wheels, H360 loader. 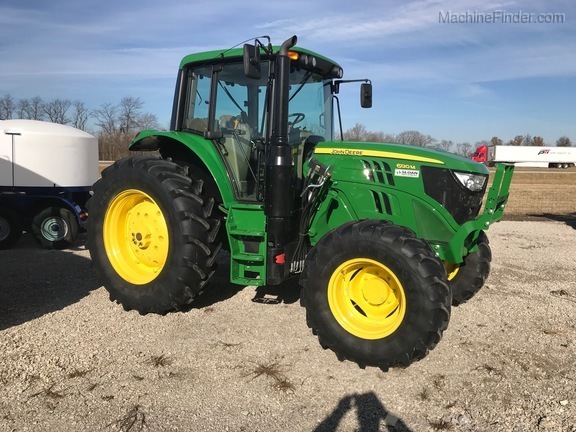 Description: CAB, MFWD, 12/12 TRANS W/LH REV, 16.9X28 & 9.4X24 TIRES, JOYSTICK W/ MID VALVE- NOT LOADER READY, RADIO, 1 REAR HYD, HOOD GUARD, NO LOADER FRAMES, TRACTOR HAS NEVER HAD A LOADER ON IT, TRACTOR IS LIKE NEW!! 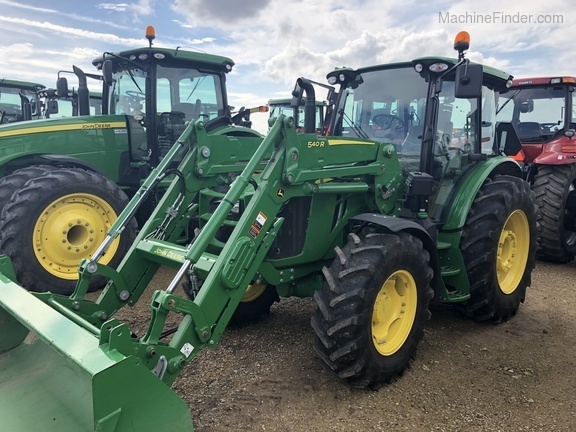 Description: NEW/DEMO 120/94hp, Std cab with Air Seat, RH Door, Command Center, AutoQuad Eco 24/24 w/ LH Rev, radio, 30gpm hyd, 3 Mech SCVs, 540/E/1000PTO, 3N/2 hitch, R&P axle 460/85R38 rear, MFWD, 14.9X24 Ldr Ready, 3 func mid mt valves, loader frame & hood guard for R-Series Loader, cold start pkg, batt disconnect, four pair rear plate weights , extra cab lights, very clean. 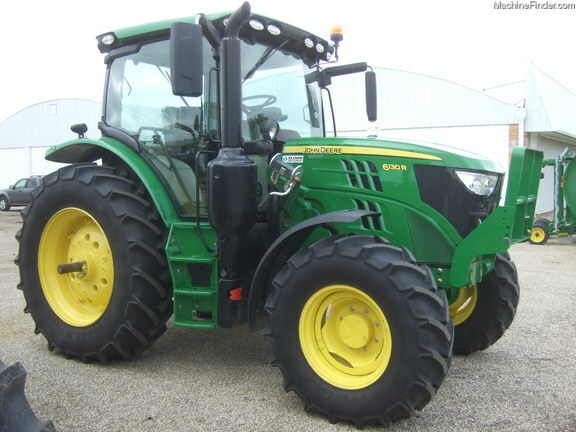 Description: 73/57HP,OPEN STATION,12F/12R TRANS. 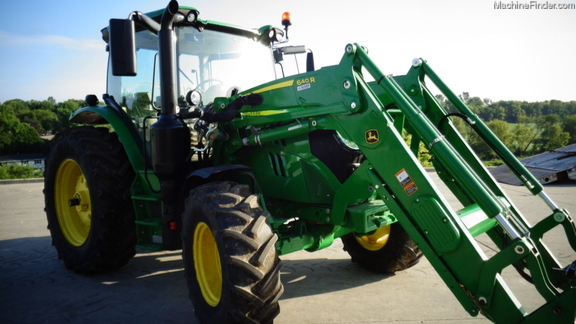 WITH LEFT HAND REVERSER, WET CLUTCH,1 REAR HYD,JOYSTICK & LOADER FRAMES FOR 520M , 16.9X28 REAR,MFWD,9.5X24 FRONT. 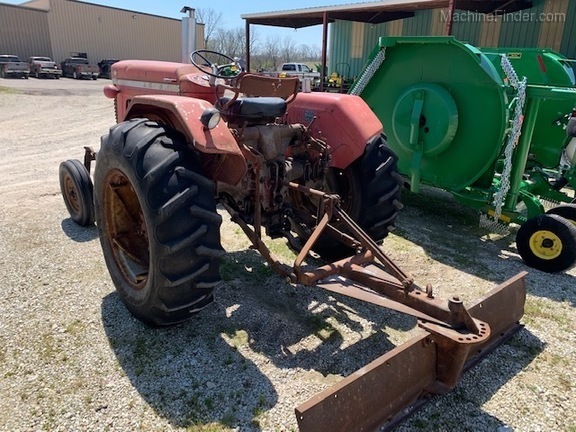 Description: Massey Ferguson MF90, gas engine, rebuilt carb, 7ft 3pt blade included. 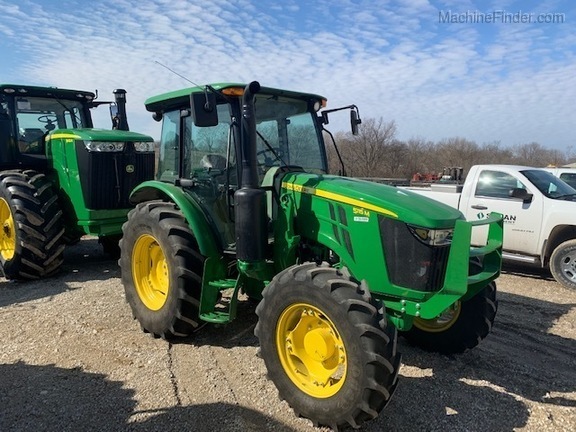 Description: 130/101 hp, Std Cab w/ Command ARM, IVT Trans, 7" display, Greenstar wiring harness, air seat, ext mirrors, radio, 3 elec SCVs, 540/E/1000 PTO, R&P axle, 460/85R38 rears, MFWD, 380/80R24 fronts, batt disconnect, Firestone tires, 3 func elec joystick, loader frames, hood guard for 620R loader. 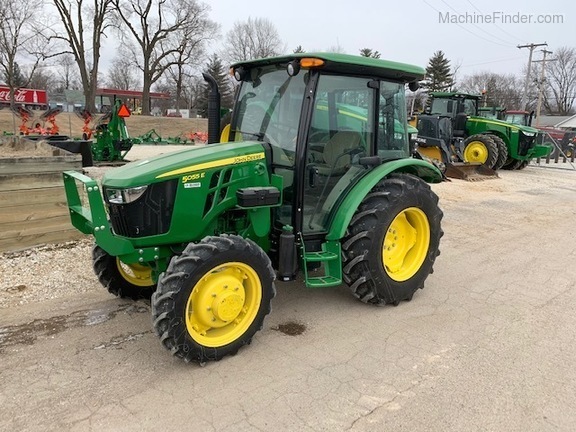 Description: 6130R tractor, IVT transmission, 3 ELEC SCV's, Premium cab, 540/1000 pto, wide angle mirrors, front fenders, R&P axle, 480/70R38 rear tires, premium radio, panorama roof, 620R loader MSL 3 function, single point 85" HD bucket. 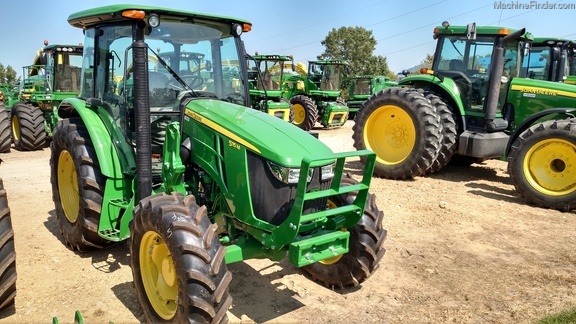 Description: 130/101 hp, Std Cab, 24F/24R AutoQuad w/ LH Rev, 7" display, Air Seat, Ext Mirrors, radio, 3 mech SCVs, 540/E/1000 PTO, R&P Axle, 460/85R38 rears MFWD, 380/85R28 fronts, cold start, 3 func joystick & mid mount valves, loader ready, hood guard & frames for 620R loader, Front weight bracket. 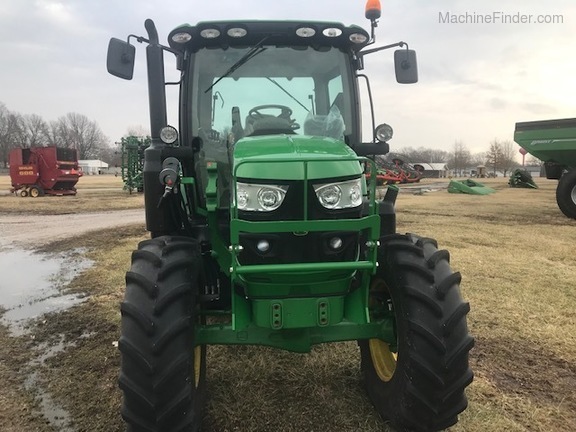 Description: 105/87hp, FT4 engine, Open Station, 24F/12R w/ LH rev, 540/1000 PTO, 2 rear SCV, 460/85R34 rears, 340/85R24 fronts MFWD, rear work light, 2 func joystick, mid mount valves, loader frames and hood guard. 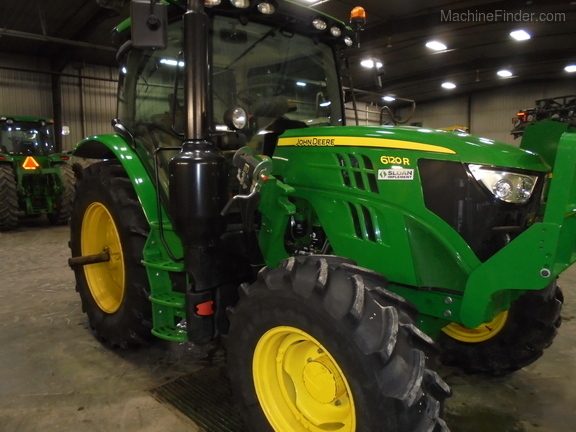 Description: 2018 JD 5115M MFWD CAB TRACTOR 32F/16R W/LH REV, CORNERPOST EXH,EH HITCH,2 REAR SCV'S, DUAL MID W/JOYSTICK,LOADER FRAME + HOOD GRD, 18.4X30 REAR TIRES,12.4X24 FRONTS,COLD WEATHER PKG, MIRRORS. 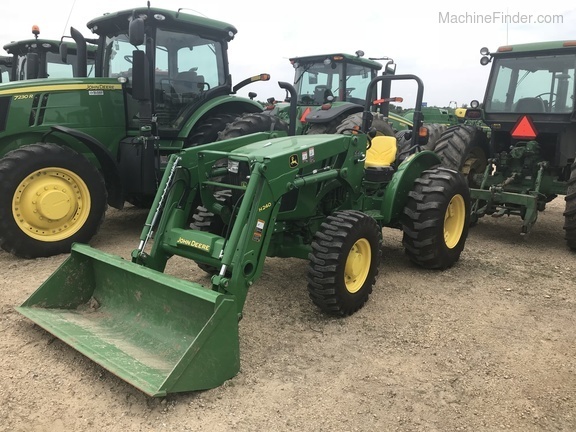 Description: OPEN STATION 5065E, MFWD, 16.9X28 R-1, 9.5X24 FRONT, 2 REAR SCV, 2 MID SCV, HAS A H240 LOADER EXTENDED WARRANTY UNTIL 10/23/2023. 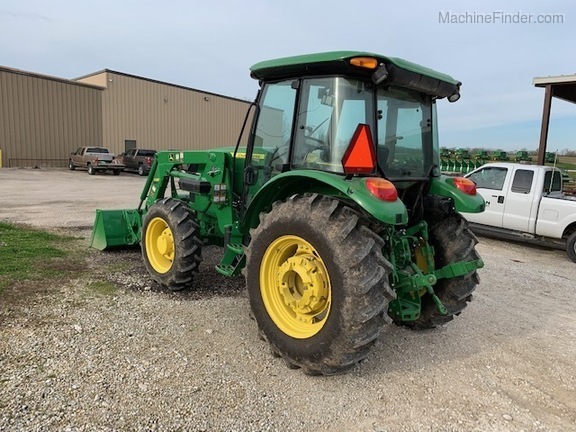 Description: 5055E MFWD TRACTOR WITH CAB MID SCV W/JOYSTICK, 16.9x28 R1 REAR TIRES 9.5X24 R1 FRONT TIRES, 12F/12R Power Reverser, RADIO, BLOCK HEATER. 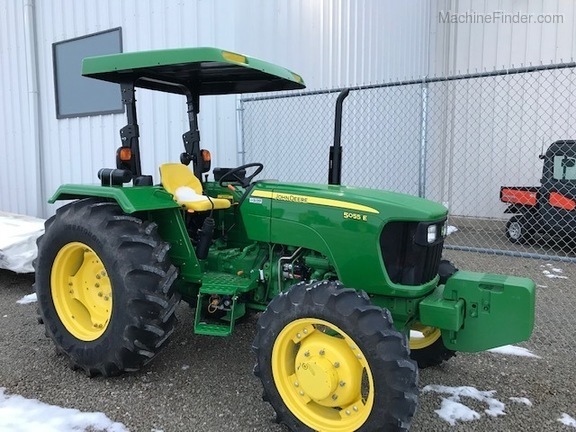 Description: 120/95 hp, Std Cab, 24F/24R AutoQuad w/ LH Rev, 7" display, Air Seat, Ext Mirrors, radio, 3 mech SCVs, 540/E/1000 PTO, R&P Axle, 460/85R38 rears MFWD, 380/85R28 fronts, cold start, 3 func joystick & mid mount valves, loader ready, hood guard & frames for 620R loader. 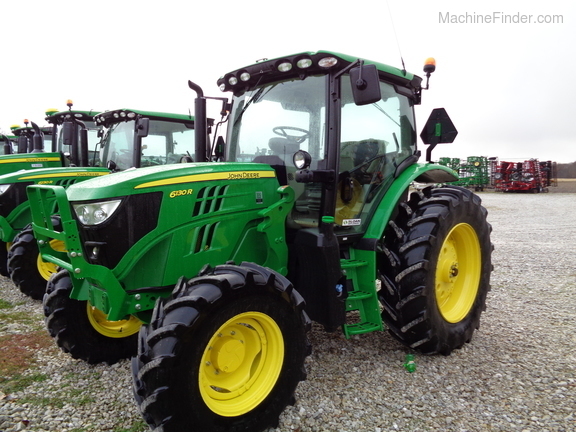 Description: 6430 PREMIUM IVT TRANS W LHR, 3 ELEC SCV, 3RD FUNC ELEC JOYSTICK, SUNROOF, 673 NON-SELF LEVEL LOADER W SINGLE PT HOOKUP, RH DOOR, 18.4R34 REAR MICH, 14.9R24 FRT MICH, ALL TIRES 90%, 540/1000 PTO, 3 REAR WEIGHTS, FLANGED AXLE. 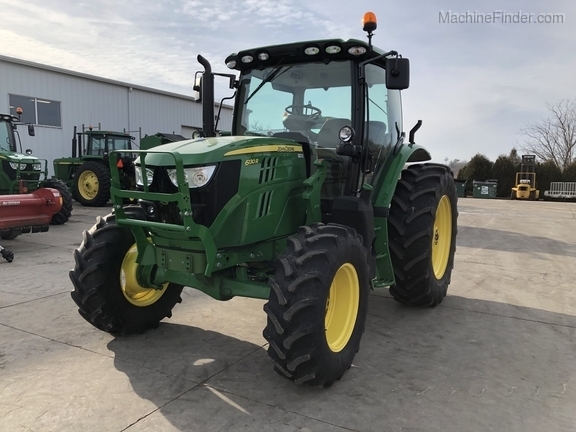 Description: 2016 JOHN DEERE 6130R UTILITY TRACTOR, IVT TRANSMISSION-40 KM/H, 4100/7" DISPLAY, NO GREENSTAR READY, JD LINK CAPABLE, 4100 PROCESSOR, PREMIUM CAB WITH COMMANDARM, STANDARD SEAT, WIDE ANGLE MIRRORS, PANORAMA WS W/ PD, STANDARD RADIO PACKAGE, 114 L/MIN HYD UPMPT, 3 E/H SCV'S, 540/540E/1000 SCV, CAT 3N/3 THREE POINT HITCH, LESS QUICK HITCH, SWAY CONTROL BLOCKS, RACK AND PINION REAR AXLE, AJDUSTABLE CAST WHEELS, 460/85R38 REAR TIRES - MITAS (80%) MFWD FRONT AXLE, 380/85R24 FRONT TIRES - MITAS (80%), FRONT AND REAR ROLLER BLIND, COLD START PACKAGE, LOADER READY PACKAGE WITH 3 FUNCTION SCV, NICE TRACTOR, USED FOR MOWING, PLASTIC STILL ON SEATS. 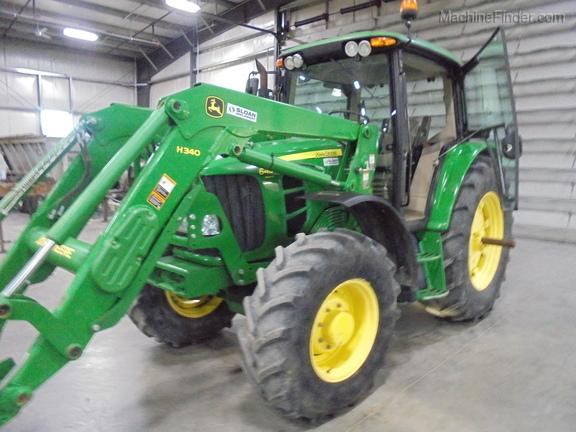 Description: 5075E, 73/57 HP, OPEN STATION, 2 WHEEL DRIVE, 9F/3R TRANS, DRY CLUTCH, 1 REAR HYDRAULIC, 540 PTO, THREE POINT HITCH, 16.9-28 REAR TIRES, 7.50-16 FRONT TIRES, ROPS. 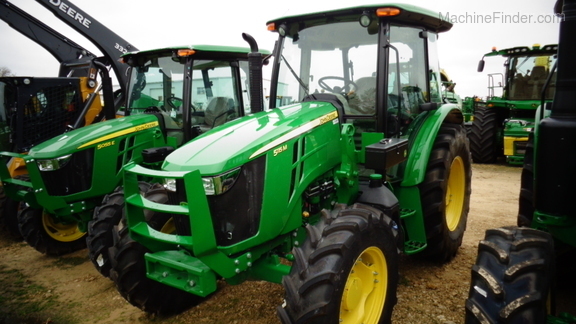 Description: New DPFS 55/45 FT4 Engine, Cab, 12F/12R trans w/ LH rev, MFWD, 16.9X28 rear, 9.5X24 front, 2 mid SCV, joystick, 1 rear SCV. 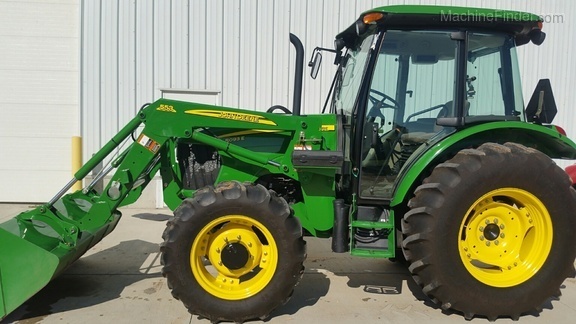 PRICE INCLUDES NEW H240 LOADER. ADD BACK $500 AND CAN OFFER 0% FOR 60 MONTHS. 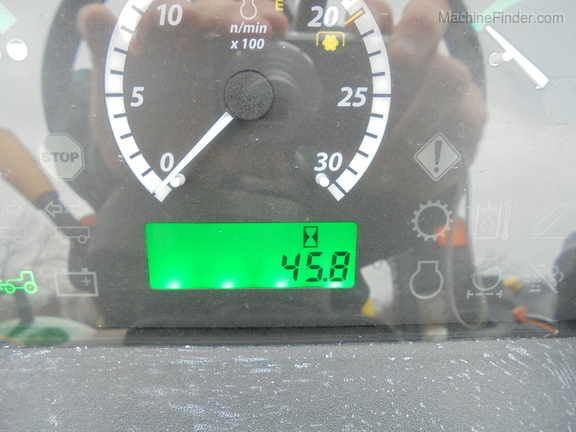 Description: 115/100PTO HP Std. 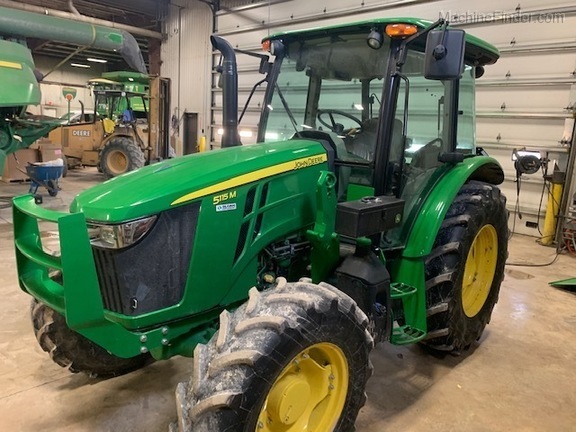 Cab w/ RH console, 32F/16R Command 8 trans w/ LH rev, Air seat, mirrors, corner post exhaust, PFC hyd sys, 3 rear SCV, 3 mid SCV, 540/E/1000 PTO, EH Hitch 18.4X34 rears, MFWD, 14.9X24 fronts, cold weather PTO remote on rear fender, loader ready, joystick, loader frames,540R SL loader w/ 85" bucket w/ cutting edge, two beacon lights - radio - Warranty until 25 November - 2019. 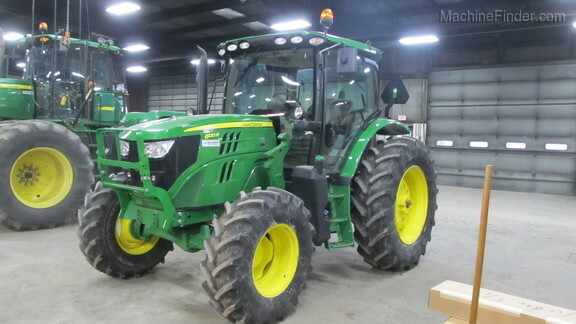 Description: JD 6115R DLX CAB, AIR SEAT, AUTOQUAD24/24 LHR, RH DOOR, 3 REAR SCV, 540/E/1000 PTO, R&P AXLE, 460/85R38, MFWD 380/85R24, JOYSTICK MID MT VALVES, HOOD GUARD, LOADER FRAMES. 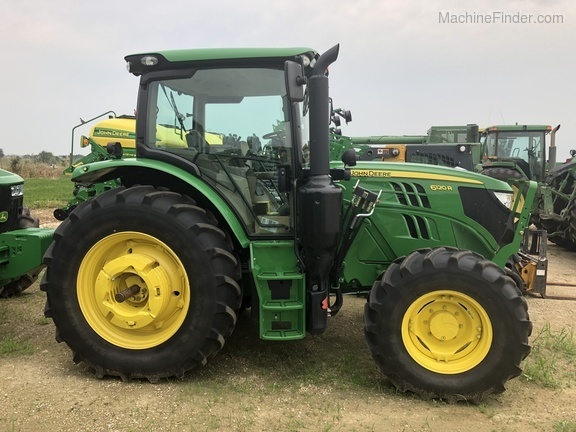 Description: 130/101 hp, Std Cab, 24F/24R AutoQuad w/ LH Rev, 7" display, Air Seat, Ext Mirrors, radio, 3 mech SCVs, 540/E/1000 PTO, R&P Axle, 460/85R38 rears MFWD, 380/85R24 fronts, Firestone Tires, cold start, 3 func joystick & mid mount valves, loader ready, hood guard & frames for 620R loader, Battery Disconnect. 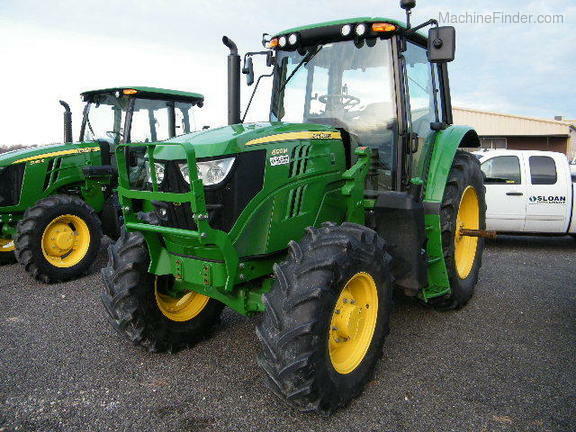 Description: 120/94hp, Std cab with Air Seat, RH Door, Command Center, AutoQuad Eco 24/24 w/ LH Rev, radio, 30gpm hyd, 3 Mech SCVs, 540/E/1000PTO, 3N/2 hitch, R&P axle 460/85R38 rear, MFWD, 14.9X24 Ldr Ready, 3 func mid mt valves, loader frame & hood guard for R-Series Loader, cold start pkg, batt disconnect, beacon lightPO # DEMO. 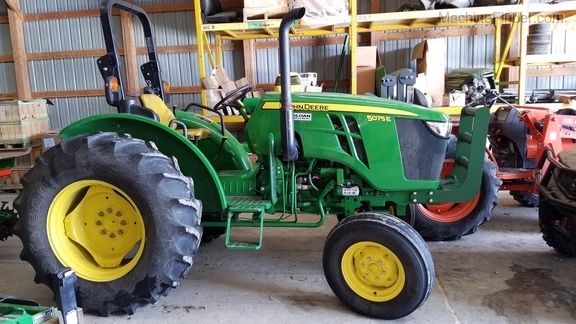 Description: 1/18/2019 2:33 PM - Joshua Zuck changed usage from R-Rental to S-Stock for 130/101 hp, Std Cab, 24F/24R AutoQuad w/ LH Rev, 7" display, Air Seat, Ext Mirrors, radio, 3 mech SCVs, 540/E/1000 PTO, R&P Axle, 460/85R38 rears New, MFWD, 380/85R28 fronts New, cold start, 3 func joystick & mid mount valves, loader ready, hood guard & frames for 620R loader, Front weight bracket, 4 tires replaced all new firestones. 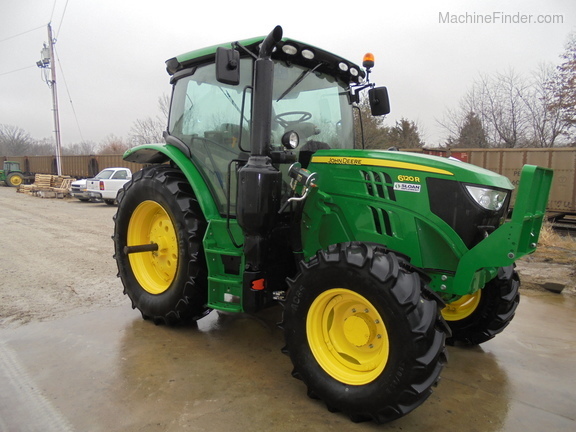 Description: OPEN STATION, MFWD, 9/3 SYNCRO TRANSMISSION, DUAL MID MOUNT SCV WITH JOYSTICK, 16.9-28 REAR, 9.5X24 FRTS, R-1 AG TREAD, FRONT WEIGHT BRACKET, 6 FRONT WEIGHTS, 2 REAR HYD OUTLETS, JOHN DEERE CANOPY, LOOKS BRAND NEW. 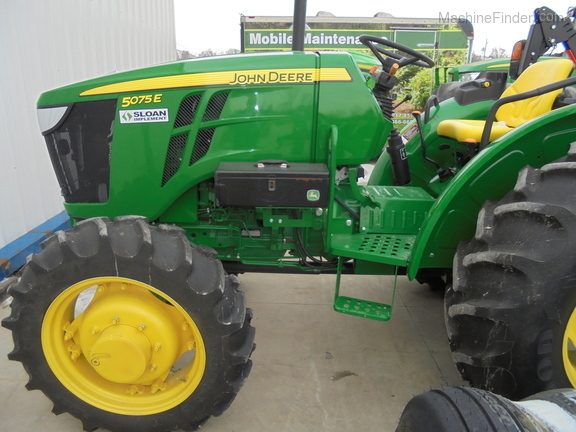 Description: 120/95 hp, Std Cab, 24F/24R AutoQuad w/ LH Rev, 7" display, Air Seat, Ext Mirrors, radio, 3 mech SCVs, 540/E/1000 PTO, R&P Axle, 460/85R38 rears MFWD, 380/85R24 fronts, cold start, 3 func joystick & mid mount valves, loader ready, hood guard & frames for 620R loader, front weight bracket. 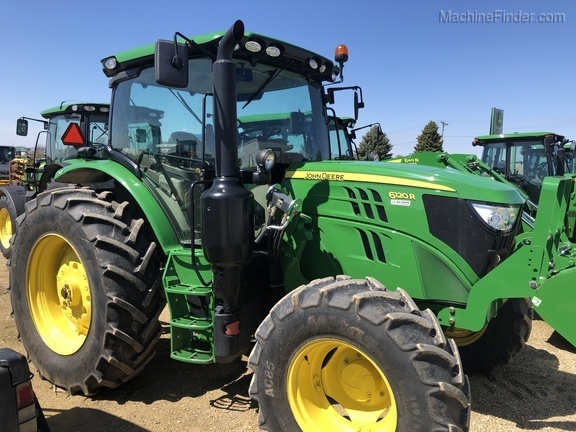 Description: 6120R MFWD, 24/24 AUTO QUAD, PANORAMA GLASS, 3 FUNCTION MID SCV, 3 REAR SCV, 30 GPM, PREM CAB RH COUNSOLE, 18.4-38 R/P AXLE, CAST WHEELS, 14.9R24 FRONT, 540/1000 PTO, PTO, TURNABLE FRNT FENDERS, 640R LOADER FT4 READY, 3 FUNCTION, SINGLE POINT, 85" BUCKET. 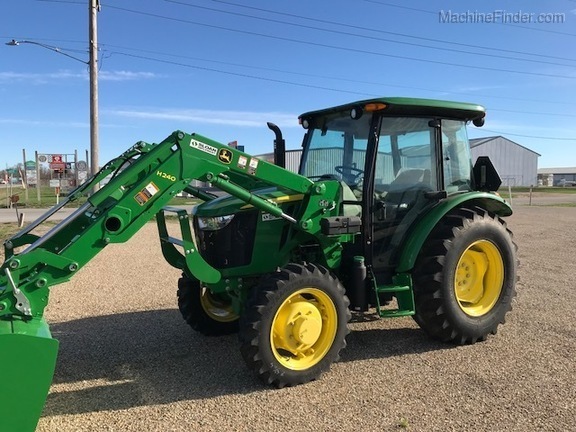 Description: FT4, 36F/12R PWR SHFT TRANS W/ LHR, MFWD, 3 MECH SCVS, 540/1000 PTO, RADIO, RH DOOR, SUNROOF, AIR RIDE SEAT, BUDDY SEAT, BEACON, L451 LDR W/ 84" GLOBAL BKT, 3RD & 4TH FNCT ON LDR, FRNT FNDRS, 420/70R24 FRONTS 480/70R38 REARS ALL 90% MICHELIN, 3 SETS OF 60KG REAR WHEEL WEIGHTS. 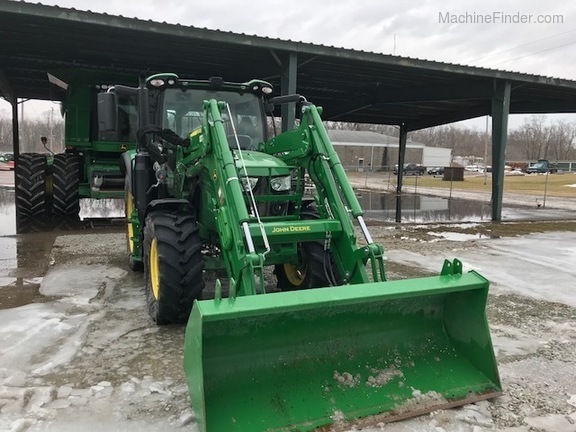 Description: 5055E OPEN STATION - 12/12 LHR - H240 LOADER W/ 73" BUCKET - REAR INNER WEIGHTS X 2 PER SIDE - BLOCK HEATER - REAR LIGHT KITS - REVERSER MODULATION CONTROL - 16.9X24 REARS 12.5/80-81 R4 TIRES - NICE CLEAN LOW HOUR TRACTOR. 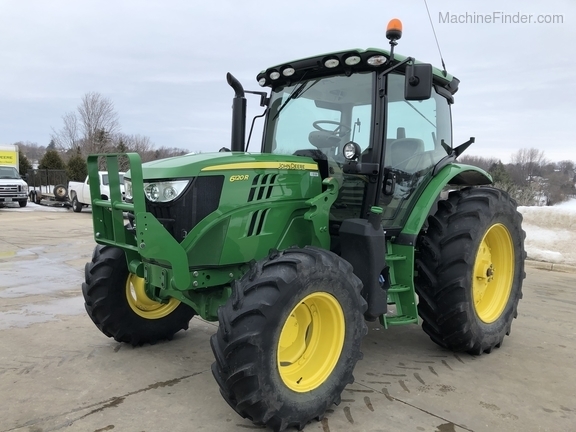 Description: 2016, 5115M, CAB, MFWD, AIR SEAT, RADIO, FT4, 32F/16R TRANS, LHR, 3 REAR SCV, 540E PTO, TOOLBOX, CORNER EXHAUST, RADIO, NEW 460/85R30 R1 FS TIRES, NEW 320/85R24 R1 FS FRONTS, LOADER PREP PKG, JOYSTICK, BRUSH GUARD, LDR FRAMES. 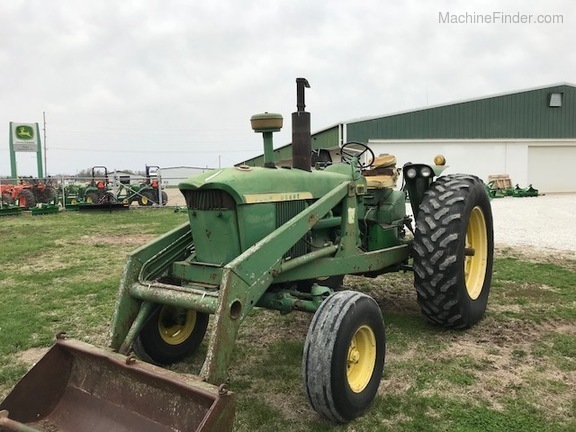 Description: MY 17, 5115M, CAB, MFWD, AIR SEAT, RADIO, FT4, 32F/16R TRANS, LHR, 2 REAR SCV, 540E PTO, TOOLBOX, CORNER EXHAUST, RADIO, NEW 460/85R30 R1 FS TIRES, NEW 320/85R24 R1 FS FRONTS, LOADER PREP PKG, JOYSTICK, BRUSH GUARD, LDR FRAMES. 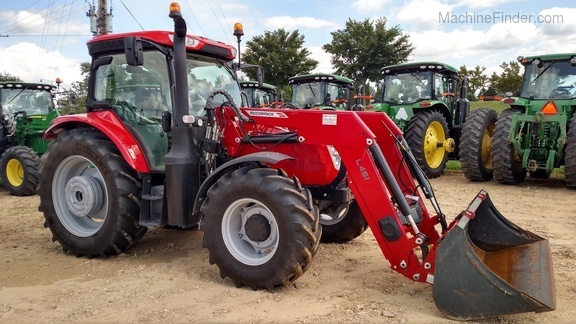 Description: 2016, 6120R MFWD, FT4 24/24 AUTO QUAD, PANORAMA GLASS, 3 REAR SCV, 30 GPM PUMP, R/P AXLE CAST WHEELS, 480/85R38 REAR 90%, 380/85R24 FRONT 40% MITAS TIRES, AIR SEAT, REAR WIPER, BEACON, TOP WINDOW, 3 MID SCV, MECH JOYSTICK, 640R LOADER WITH 3RD HYD FUNCTION, 85" BUCKET, SINGLE POINT HYD HOOK UP, GLOBAL. 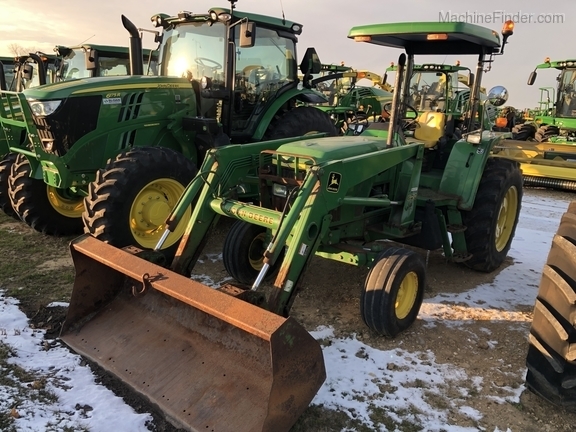 Description: Cab, MFWD, LH Reverser, 12F/12R Trans, 2 Rear Hyd, 2 Mid Hyd, 540/540E PTO, Diff Lock, AM/FM Radio, Block Heater, 18.4x30 Rear Tires, 90%, JD 553 Loader, 73" Bucket, Cold A/C, Eco Liquid Ballast in Rear Tires, Super Sharp.